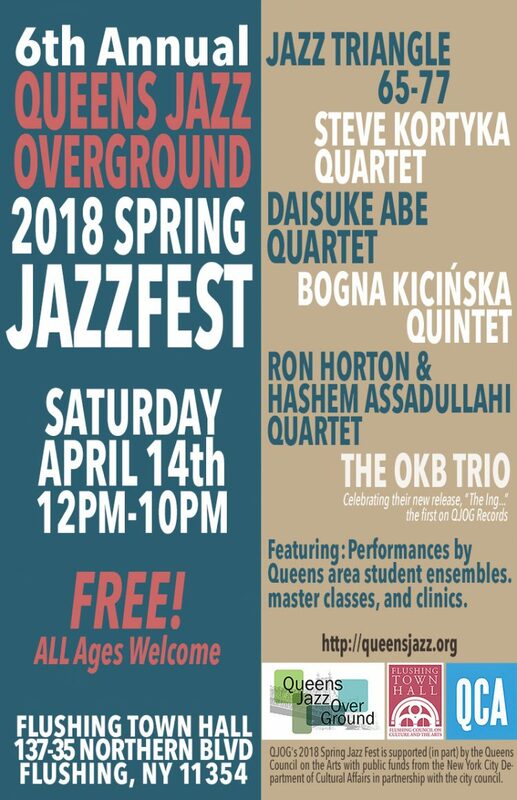 New York, NY (March 13, 2018) – The Queens Jazz OverGround, a collective that promotes jazz performance and education in the borough of Queens, will present our 2018 Spring Jazz Fest, a free, daylong series of jazz workshops and performances. All events will take place at Flushing Town Hall on Saturday, April 14th from 12:15 pm – 10:00 pm, 137-35 Northern Blvd (corner of Linden Place), Flushing, NY. To create a more inclusive experience, we are integrating the educational and professional components of our schedule. Student Performers – Student big bands and small combos from Queens based schools will perform and participate in clinics with professional jazz musicians. Audiences are welcome at all performances and clinics. For more details, see below and please visit www.queensjazz.org or email queensjazzoverground@gmail.com. For directions to Flushing Town Hall, visit http://www.flushingtownhall.org/visiting/directions.php. The Queens Jazz OverGround (QJOG), an artists’ collective, is a not-for-profit organization. QJOG supports the professional growth of jazz artists in Queens, provides musical enrichment and education to local communities, and helps to stimulate wider awareness of Queens as a destination for arts and culture. QJOG offers low- or no-cost jazz performances in Queens for diverse audiences; supports young and emerging artists by providing jazz education; and promotes the work of local jazz artists and composers. The Queens Jazz OverGround is proud to present this event in collaboration with Flushing Town Hall, a Smithsonian Institution Affiliate. Flushing Council on Culture and the Arts (FCCA) is a revitalizing force for its community and a creative catalyst for developing and promoting the arts throughout the borough of Queens in New York City. Each year, FCCA presents an array of high quality arts and educational programs at Flushing Town Hall, as well as providing vital services to local artists, arts organizations and community residents. FCCA offers a range of programming, including musical, dance and theatrical performances and exhibitions of diverse cultures from around the world. FCCA collaborates with the Smithsonian to bring artifacts, scholars, and educational programs to Flushing. The Queens Jazz OverGround’s 2018 Spring Jazz Fest is supported (in part) by the Queens Council on the Arts with public funds from the New York City Department of Cultural Affairs in partnership with the city council.